Curious Louis: Who is the oldest person in St. Louis? Longtime St. Louis resident Lucy Hamm celebrates her 109th birthday with her family and her retirement community in Chesterfield. Hamm was born on Jan. 30, 1908. It might be harder than you think to find the oldest person in town. Local governments don’t formally track the data, and voting records are often manually entered, and can contain errors. So when a listener named Sally asked our Curious Louis project to find the oldest person in St. Louis, we started looking. After calls to county election boards and senior service nonprofits came up short, employees in the office of St. Louis Mayor Francis Slay introduced us to someone who might just be the winner: 109-year-old Lucy Hamm. Listen: Finding the oldest person in St. Louis is harder than you think. Even better, she invited us to her birthday party. “Happy birthday to me!” Hamm beamed, resplendent in a blinking tiara and bright red lipstick. 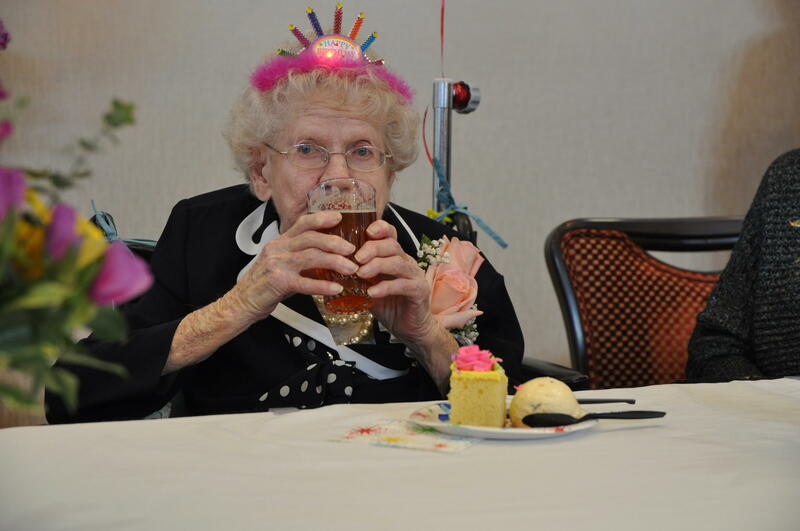 Lucy Hamm enjoys a pale ale from Schlafly at her 109th birthday party in Chesterfield. Beer is her favorite, but she also enjoys a good whiskey sour. Hamm was known as the “sheriff” of Tower Grove Manor before she moved to Chesterfield. There were balloons, a yellow cake, and even a six-pack of her favorite Schlafly beer, which she still enjoys. Her grandson took her to the brewery when it first opened, and she has been a loyal fan ever since. 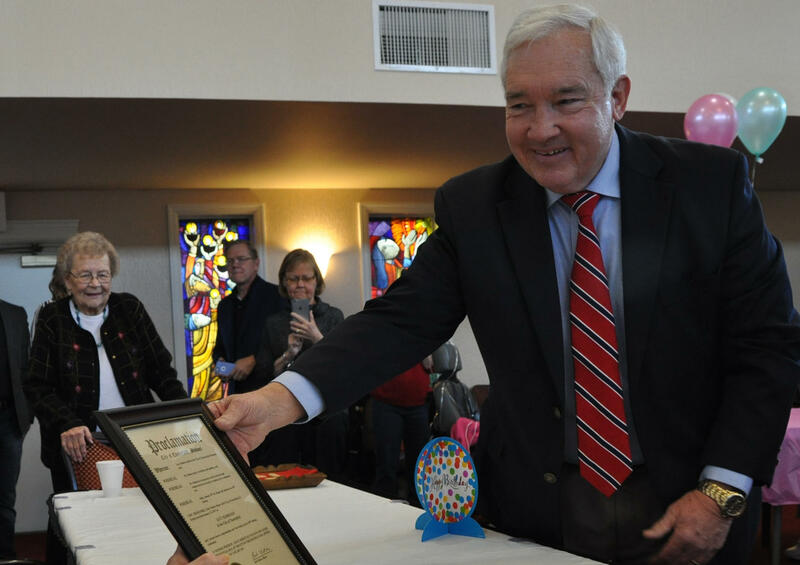 Bob Nation, the mayor of Chesterfield, presents Lucy Hamm with a proclamation in honor of her birthday. Local governments don't formally track how their local resident is, and rely on nominations from family members and nursing homes to make these pronouncements. In fact, Hamm has become a bit of a local celebrity in years’ past. St. Louis Public Radio interviewed her in 2015, when she turned 107; The Riverfront Times covered her 108th birthday bash. Hamm was born Jan. 30, 1908. That's the same year Henry Ford introduced the Model T, and the Cubs won the World Series before their century-plus dry spell. She grew up in the river town of Cairo, Illinois, — “down south, between where the rivers come together,” she explained. 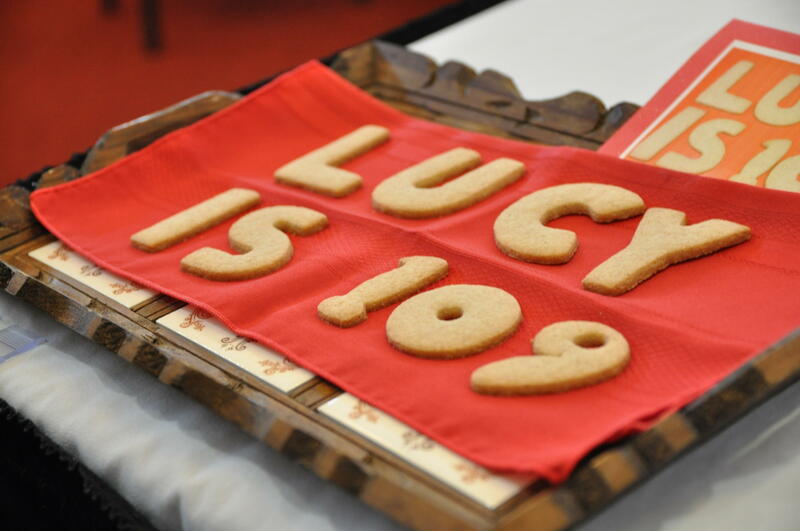 At the party, nursing home staff presented Lucy Hamm with a plate of cookies in her honor. Hamm married a barber and moved to St. Louis. She worked sewing burial shrouds for her sister, who was an undertaker. Later, Hamm worked in a shoe factory, and taught herself how to be a bookkeeper. Lucy Hamm had two children, and presides as matriarch over seven grandkids, 11 great-grand children, and a 3-year-old great-great-grandson. “People used to ask her how come she lived so long. And she’d say I drink a beer every day except Sunday. Then it went from that — she said that didn’t sound too good — to 'I ate an apple a day, ' but then it got to be hard work,” Janice Hamm said. She is pretty sure her mother-in-law is the oldest person in the St. Louis area. But if you know someone who’s 110, make sure to give us a call. Lucy Hamm, one of St. Louis’ oldest residents, turned 107 Friday. She's just nine years younger than the oldest known person living in the world, Misao Okawa of Japan. Hamm was born in Cairo, Ill., on Jan. 30, 1908. She moved to St. Louis in her 20s and has lived in the Tower Grove Manor retirement community in south St. Louis for 14 years. Americans are putting off retirement past the age of 65 — how does that change aging? Earlier this summer, the Pew Research Center released a report that found nearly 19 percent of Americans over the age of 65, nearly 9 million people, were working full- or part-time. That percentage has steadily increased since 2000. As a teenager, Elizabeth Herring of Ladue escaped a life luxury by joining the circus. Tonight, she’ll be back in the ring, celebrating her 90th birthday at a party benefiting St. Louis’ Circus Harmony. Morgan Hagedorn asked a question of Curious Louis that we’ve heard echoed at least 1000 times in 1000 different situations all over St. Louis. Curious Louis: How did Dogtown get its name? “Dogtown? How did it get its name?" That was the query to Curious Louis from attorney Nathan Goldberg, who wondered about the colorful name of the historic St. Louis neighborhood located just south of Forest Park.